Europe’s three largest medical cannabis markets could double in size in 2019, making this a “transformative” year for the European market, according to a new report by United Kingdom-based analytics firm Prohibition Partners, launched alongside the Davos World Economic Forum. 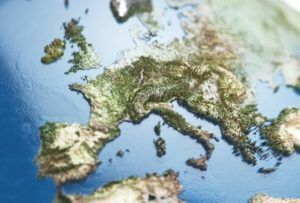 The European cannabis market’s value skyrocketed last year, with 500 million euros ($560 million) already invested in the market, which was mostly funneled into distribution and cultivation licenses. In the near term, Europe’s three largest medical cannabis markets – Italy, Netherlands and Germany – will see patient counts more than double to a combined 225,000 this year. Over the next decade, “The European Cannabis Report” predicts the total market for medical cannabis could surpass 58 billion euros. “Europe is seeing a fast-paced wave of regulatory and legislative change,” the report notes. The report breaks down commercial opportunities in production, processing, distribution and retail, digital and ancillary. Serious access restrictions exist in the United Kingdom despite doctors being legally able to prescribe medicinal cannabis since Nov. 1, 2018. 2019 could be a big year for the World Health Organization as it reassesses its position on medical cannabis. MMJ is legal in 14 countries in Europe. Regulations are expected to evolve to improve patient access and allow business opportunities. Germany, Italy and the Netherlands could see a medical cannabis market grow to 18 billion euros in the next decade. So about the size of Oakland’s Ca. cannabis market. The term representation of the Oakland’s “patient” is different than the european. They purchase their medicines at a pharmacy with a recurring doctor prescription, at a very different level of control (GMP Cert, ISO, etc) and a very different price… they don’t purchase from a “dispensary” if and when they feel like getting high. These are great forward looking numbers, again, about the size of Oakland’s patient count. Harborside dispensary, by my estimate services about 75,000 patients alone. Combined with California’s regulatory disaster, only twenty percent of cannabis consumers use dispensaries. If California actually allowed prop 64’s text as voted on to be implemented, the rest of the world would be playing catch up for years to come. This may be a lopsided argument as California, a single state in our union is also the fifth largest economy in the world. California has always been the worlds largest cannabis economy, importing cannabis to all other states and many other countries. These numbers will swell as regulations make it so much easier to go black market. Nothing but the best for our European cannabis neighbors, we’ll save a seat for you at the finish line. Nonetheless, 225,000 people. Multiple that by whatever reasonable figure you want, and recognize that pharmaceuticals in Europe have significantly lower prices than in the US, and those 225k patients across 3 countries represent a market smaller than Colorado. Even at US$12/day/patient, it’s under US$1B. Even that number is fake. No way that Italy, Netherlands and Germany combined had over 100k patients in 2018. It’s pretty sad that these reports get so much attention when all they do is write big fake numbers. “launched alongside the Davos World Economic Forum” I’m guessing this means the only thing the UK-based analytics firm has to do with the actual forum is… timing? Very misleading title: the analytics firm and their report had absolutely nothing to do with the World Economic Forum in Davos. Someone from the firm went to have lunch at a private, non-official, side-event in Davos while the WEF was taking place, so they timed the launch of the report to make it look like it had something to do with the WEF. And most of the numbers in the report are grossly exaggerated to make it look as if Europe was a gold mine so that they can easier get clients for their consultancy work.